This careful and profound new work is a collection of previously published essays examining the experience of Scripture in the way it informs a wholly Christian life. With a special focus on the commandments and the Psalms, there is also a generous section on what other parts of the Old Testament have to say to our observations of theology today.In the first section, Patrick Miller is compelling in his portrayal of the rich complexities of the Ten Commandments and convincing in his assertion that aspects of the Decalogue appear and are expanded throughout Scripture. His second section shifts to the Psalms, revealing them to be as much a book of theology as a book of poetry and song, pointing a way of faith and life. The final section expands to consider more wide-ranging topics in theology and anthropology, contemplating the character of God and the nature of the human. "Part of being human, Miller writes, is a slow building up of trust based on experiences of God's earlier deliverances. . . . It is in insights such as these that Miller is at his best. Throughout the book Miller's writing is logical and profound. A close but clear reading is possible because Miller walks a reader through to his conclusion. One may not agree with all the conclusions reached, but Miller arrives at them fairly and with both textual and scholarly support. He offers fellow scholars and students alike a wealth of insights based on a lifetime of study. His book provides an excellent tool; it is an up-to-date reference work, particularly on the commandments and the Psalms. It is sure to be cited widely by those writing journal articles. Miller's work -- always outstanding, always reasoned, alwayswell-written -- leaves a reader grateful for the chance to be walked through the richness of topics in the biblical text by one who has so profoundly shaped biblical scholarship for decades." 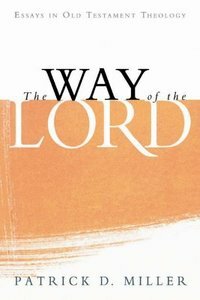 -- Robin Gallaher Branch in "Review of Biblical Literature"
About "The Way of the Lord"
Patrick D. Miller is Charles T. Haley Professor Emeritus of Old Testament Theology at Princeton Theological Seminary in Princeton, New Jersey. He is the author of numerous books, including "The Religion of Ancient Israel". He is coeditor of the Interpretation commentary series and the Westminster Bible Companion series. In 1998, he served as President of the Society of Biblical Literature. He was also editor of "Theology Today" for twenty years.